World News – Researchers in South Africa are taking recycling to the extreme. In what they’re calling a first, they’ve found a way to make building bricks out of human urine. 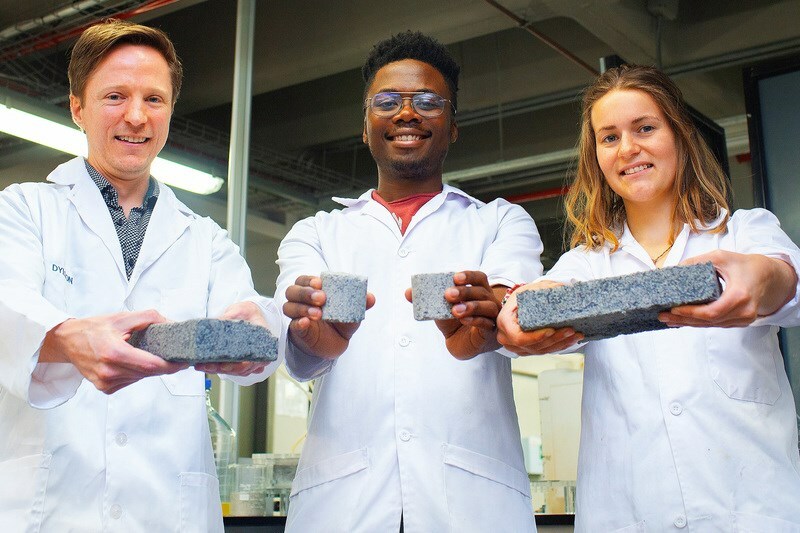 The bricks may sound icky, but the University of Cape Town researchers say their “bio-bricks” offer crucial advantages over the conventional clay bricks that have long been a mainstay of the construction industry. In addition to making use of urine that otherwise would end up in waste-processing plants, the bio-brick-making process generates nitrogen and phosphorus, which can be used to make fertilizer. And while the baking process used to make clay bricks releases large quantities of the greenhouse gas carbon dioxide, bio-bricks are made at room temperature. To make the bio-bricks, the researchers first collected urine using a special fertilizer-making urinal installed in a bathroom at the university. Then they took the liquid left over after the fertilizer was removed and mixed it with sand and a strain of bacteria that produces an enzyme called urease. Urease breaks down urea, a key component of urine, while producing a compound that binds the sand particles together to create a hard, gray-colored brick. Suzanne Lambert, a master’s student at the university and one of the bio-brick’s developers, likened the process to the one marine organisms use to form coral reefs. It’s “how biology has been building structures for millions of years,” she said. It takes the bio-brick mixture about a week to harden into its final shape, whether it’s a cylinder or a traditional rectangle. The bio-bricks are said to pose no health risks, and while initially they give off a strong ammonia smell, the odor typically dissipates within a few days. By varying the molds used to form the bricks and the length of time the chemical process is allowed to continue, the researchers are able to produce bricks in various shapes and strengths. “The longer you allow the little bacteria to make the cement, the stronger the product is going to be,” Randall said in a statement. It takes about five gallons of urine to produce a single bio-brick — or, as the BBC reported, the amount produced in roughly 100 trips to the bathroom. “We need to rethink what buildings are made out of, and expand what we think is possible,” Locke said. A New Costa Rica Holiday? Abolition Of The Army Day!